On October 5th, join the Nation Solar Tour by visiting the solar installations in and around Ypsilanti Michigan. 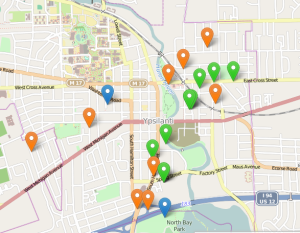 SolarYpsi is organizing this year’s tour again with over 10 solar installation within walking distance of each other in the City of Ypsilanti, and several more a short ride away. All sites are listed on the SolarYpsi.org website with details about each installation. We suggest visitors start by driving by GW Kent as they exit I94 (exit 183) and head North on Huron Street. They have almost 20kW on their roof, but it’s hard to see from the street. As you head North, stop at 403 South Huron and check out the 40 solar panels on the roof and car port in back. This location is actually three different systems, one for each apartment. As you leave 403 Huron, turn left on Buffalo Street and then right on Washington to see a small 4 panel installation on the back of 314 S. Washington. Dawn will be around to tell you about her solar installation. From there turn right on Catherine and left back on Huron Street heading North. Before you enter downtown, stop at City Hall, at 1 South Huron, where Dave Strenski will be giving continuous solar talks and answering questions about solar power. From there head over to the Ypsilanti Food Cooperative at 312 North River where you will learn about three different installations on their roof: a 2.3kW system installed in 2005, the 6.0kW system that powers 100% of the River Street Bakery, and the newest 4.0kW system. Volunteers will be on hand to answer questions and show you the inverters, panels, and meters. They will also be selling SolarYpsi t-shirts. Then make your way over to Adams STEM Academy at 503 East Oak Street to see a solar awning installation up close on the side of the school. From there head over to 817 Hemphill where Larry will be explaining the solar installation that he’s been working on over the past summer. If you need a WiFi connection during the tour, stop by Frog Island Park, at 600 Market Place or Hamilton Crossing where there are free, solar power WirelessYpsi WiFi hot spots. On the west side of Ypsilanti, you need to stop and visit Amy at 8 N. Mansfield. Not only is this a very visible 4kW installation on their garage, but Amy is a licensed electrical contractor and solar installer. A good way to end the tour is to head over to the Corner Brewery where they have a very large installation of 140 Detroit made PowerPanels. They will have beverages on tap and food to recharge your minds. Garth from PowerPanel will be on hand to explain the Brewery’s solar installation and the unique technology of their panels that collect both electrical and thermal energy. 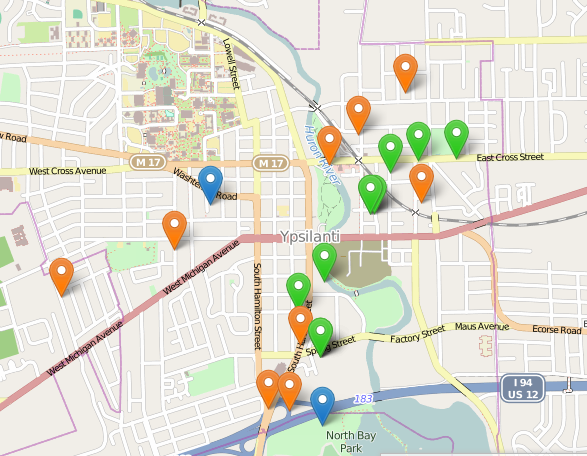 Don’t forget to visit some of the other solar installations in the area, either before or after you visit Ypsilanti, a “Solar Destination”.